These Services and Pricing are exclusively for our Butterfield, Schaumburg & Evanston Locations. More than your typical manicure and pedicure. These hand and foot treatments are based off the ancient art and science of healing with power of nature. Stress relieving plants, essential oils combined with Aveda’s signature foot massage techniques, are designed to reduce tension and agitation and promote healing. Nails and cuticles are professionally groomed and polished. Did you know that 44% of adults suffer adverse health effects from stress and that 95% of all physician office visits are for stress-related ailments? Let Asha show you how ancient Indian healing traditions combine with modern science to relieve your stress. The Stress Fix Manicure and Pedicure experiences begin with a hand or foot soak in a warm, lavender-scented bubbling bath. Your fingers and toes are then exfoliated with Aveda’s Stress-Fix Sugar & Mineral Enriched Salts. Pure ingredients of French-sourced lavender, lavandin, and clary sage are the magic responsible for this clinically-proven, stress-relieving aroma. Your treatment continues with a moisturizing massage using Aveda’s Stress-Fix Hydrating Body Lotion that has the same proven stress-relieving aroma as the enriched salts, leaving you free of tightness and tension. Finally, your hands and feet are enveloped in warm, lavender-scented paraffin. Your unforgettable experience and relaxation finishes with a polish of your choice. Used in an express environment to enhance your Manicure & Pedicure, our pure AVEDA aroma ritual utilizes a different element of nature each month to evoke a specific feeling or mood. Pure and natural aromas work with the serotonin in your brain to make you feel soothed, energized, refreshed or renewed. Plus they smell unforgettable! Our speedy manicure & pedicure touches on all the basics: nails are filed, cuticles are clipped and polish is applied. This memorable service, only an hour in length, saves you time and gives you the opportunity to take home our signature Aroma of the Month in your own .5 ounce AVEDA PureFume bottle so you can continue this one of a kind exhilarating aroma experience at home. When reserving this experience, please inquire about our Aroma of the Month. This is not your everyday nail service. Asha’s Hydrating Manicure and Pedicure are a hand and foot therapy experience! Our customized care includes proper maintenance and grooming of nails and cuticles, personalized massage, customized exfoliation, and a luxurious treatment masque. This is a necessary spa experience to keep your hands and feet looking and feeling great. This experience features a stress relieving massage with orange and eucalyptus, leaving your hands, arms, feet and calves, looking younger and brighter with each experience. This graceful style showcases white nail tips highlighted by a neutral base, ideal for moderate or short-length nails. Ground and balance yourself beginning with your hands and feet. This service combines our signature manicure/pedicure steps with Aveda’s 7 energy balancing oils and sprays. It starts with a sensory journey of sight and small, and finishes with the corresponding chakra reflex massage. This experience will leave you totally enlightened. Around the world for thousands of years, particularly in India and its neighboring countries, coconut oil has been used during massage to keep skin gleaming, smooth, and beautiful even into a person’s golden years. Coconut oil is rich in vitamin-E, your skin’s best friend, which keeps your skin rejuvenated, young, and healthy. This masculine hand and foot experience invigorates, cleanses and exfoliates. Warm steamed towels soothe and prepare the hands and feet for our signature stress relieving hand and arm reflex massage with warm indulgent oils. For the expectant mom who is busy nurturing a new, tiny life, let us pamper her. Keeping mom and baby in mind only the most gentle aromas and oils are used to lighten and revive swollen tired legs and feet. Features a careful yet stress relieving foot massage and hydrating hand therapy. Let’s face it, you’ve neglected those feet for far too long, but your time is limited! Indulge those overworked, under-appreciated toes by treating them to a Peppermint Manicure and Pedicure combination that uses Aveda’s philosophy to tone, balance, and hydrate your hands & feet. This treatment, perfect for awakening tired, exhausted feet, begins with a sensory journey to determine your skin balance needs. Experience the same rituals and results of Asha’s signature Manicure and Pedicure, with the added benefit of Peppermint, in only 1 hour and 15 min! It’ll leave you relaxed, refreshed, and ready to impress! A hybrid between nail lacquer and gel, “No-chip” is brushed on, just like polish and then dried under a UV light. 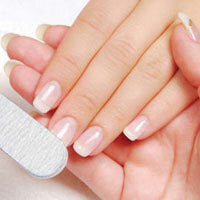 Each no-chip manicure service can potentially last anywhere from 2 to 4 weeks! This finished look is just like fresh polish but dries immediately with amazing durability. Too good to be true? We thought so too! For those who currently do NOT have a No-Chip Manicure on their nails. For those who currently DO have a No Chip Manicure on their nails and need to change the color. Refresh your nails with a totally new no-chip application and polish color. For those who currently DO have a No-Chip Manicure on their nails and wish to completely remove their overlay and return to their natural nails. This service includes removal with a "soak-off" and mini manicure.